The Mul Hahar monorail ESB specialises in lifting loads locally and in linear point-to-point transport. With the help of curved sections your hoist is able to travel through the building exactly as you need it to. Workstations could be linked in this way if required or the crane could be adapted to fit individual machinery locations. Two crane tracks are suspended in parallel for the Mul Hahar double rail system ZSB with the hoist suspended between them. The loads are distributed more evenly meaning less loading for the building structure. Wider suspension spacing is possible. 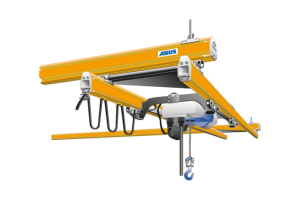 The Mul Hahar single girder crane EHB is the most straightforward HB system solution for area-coverage materials handling within buildings. The EHB is a very light crane due to the simple construction of two crane tracks and one crane girder which makes it easy to move the EHB manually. 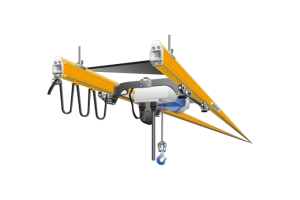 This crane is ideal to be installed in lightweight buildings with low load-bearing ability. 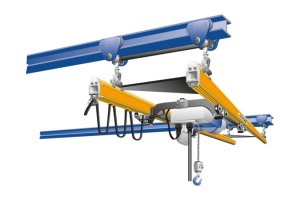 The Mul Hahar double girder crane ZHB is our answer for heavy loads combined with area-coverage transport. The ZHB is also characterised by long crane spans. 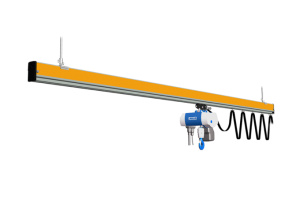 The Mul Hahar chain hoist is also suspended between the crane girders making for an optimised lifting height. 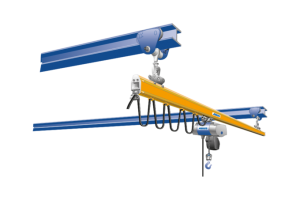 The Mul Hahar double girder crane ZHB-3 teaches us how obstacles can be overcome: This double girder crane is suspended from three crane tracks. Very long crane spans become thus possible making the crane able to service large surface areas. 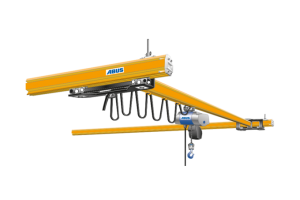 The Mul Hahar single girder crane EHB-I is a good solution for area-coverage material transport in buildings that have existing rolled-section girders fitted at a distance appropriate for crane tracks. 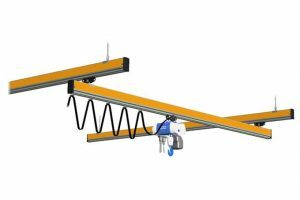 The lightweight crane girder consists of a hollow profile suitable to run directly on this rolled-section girder crane track when combined with the two underslung trolleys. 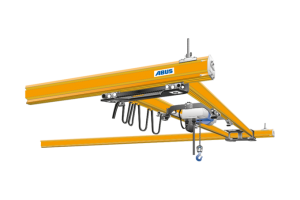 The Mul Hahar double girder crane ZHB-I is our answer for heavy loads combined with area-coverage material transport. The ZHB-I is also characterised by long crane girder lengths. The crane travels directly on crane tracks consisting of rolled-section girders. 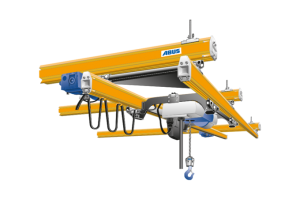 The Mul Hahar chain hoist is also suspended between the crane girders making for an optimised lifting height.